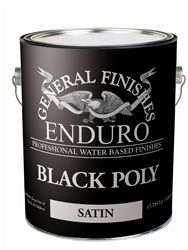 General Finishes Enduro Pigmented Polyurethane is a durable finish that can be used as a final color coat on cabinetry and other projects where an opaque finish is required. Available in Black or White Satin Sheen, the White Poly can be tinted to various off-white colors such as Benjamin Moore Cloud White. Please contact us for information about tinted products. Enduro Pigmented Poly can be further topcoated with General Finishes Clear Poly when advanced durability and mar resistance is required.